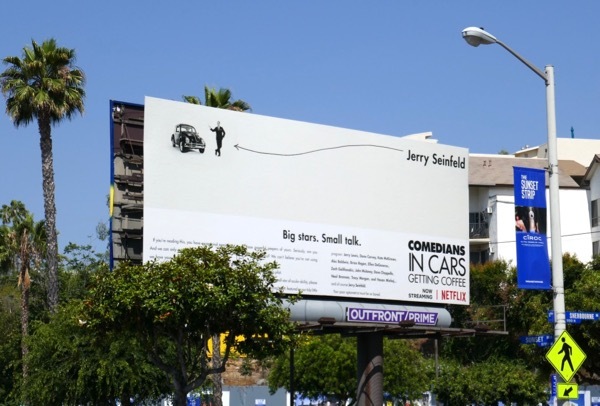 For the tenth season of Jerry Seinfeld's Comedians in Cars Getting Coffee the comedian moves the long-running, ride-sharing series from Crackle to streaming giant Netflix for twelve all-new episodes. Joining him for a cup of joe and conversation this season include the likes of Ellen DeGeneres, Zach Galifianakis, Dave Chappelle, Tracy Morgan, Kate McKinnon, Alec Baldwin and more. 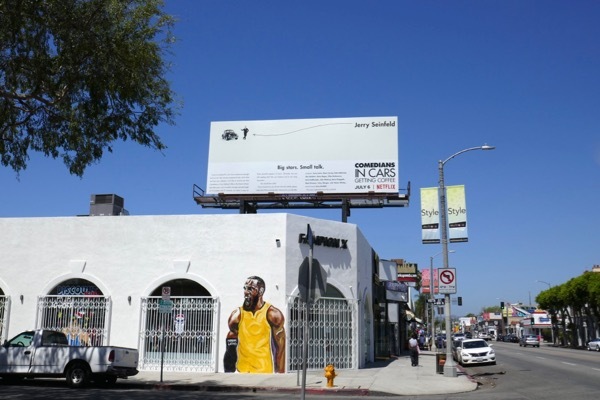 These season ten billboards were first spotted along the Sunset Strip on July 4 and later above Melrose Avenue on July 13, 2018. 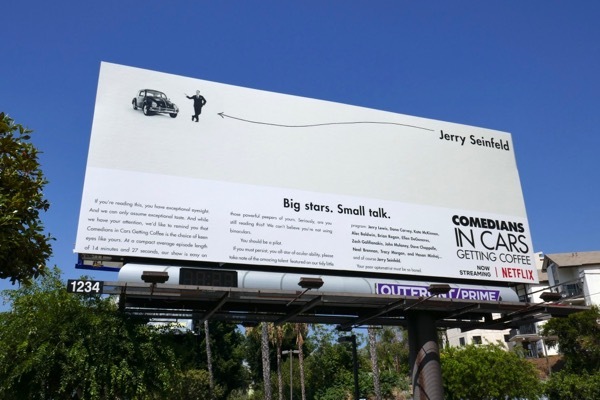 There's something about this ad creative that looks like a typical car advertisement which makes it stand out amongst all the other entertainment billboards, although if you're able to read the small body copy when you're driving past then you really must have excellent vision. "If you're reading this, you have exceptional eyesight. And we can only assume exceptional taste. 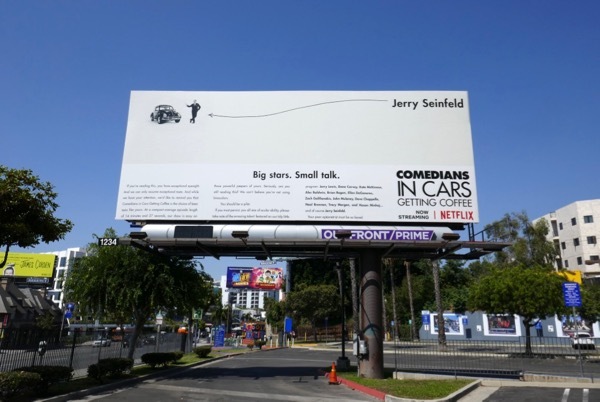 And while we have your attention, we'd like to remind you that Comedians in Cars Getting Coffee is the choice of keen eyes like yours. At a compact average episode length of 14 minutes and 27 seconds, our show is easy on those powerful peepers of yours. Seriously, are you still reading this? We can't believe you're not using binoculars. You must be a pilot. If you persist, you all-star of ocular ability, please take note of the amazing talent featured on our tidy little program: (lists guests). Your poor optometrist must be so bored". 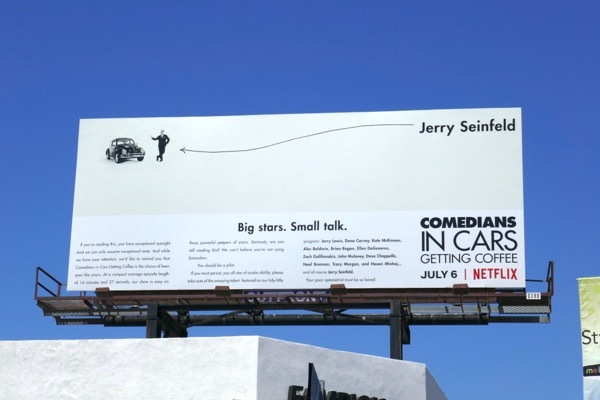 Fans of the comedian can also check out these Seinfeld sitcom billboards and these Jerry Before Seinfeld comedy special billboards. So if you have fifteen minutes to spare, grab a fresh brew and let some big stars and their small talk entertain you for a few.